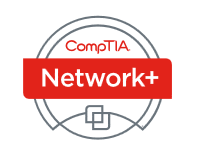 "CompTIA Network+ is a vendor neutral networking certification that is trusted around the world. It validates the essential knowledge and skills needed to confidently design, configure, manage and troubleshoot any wired and wireless networks. CompTIA Network+ certified individuals are in-demand worldwide." Link - CompTIA website for more information. Data networks are the lifeline to businesses with the keys to the critical financial, healthcare and information services that need to function at the most secure level. With a CompTIA Network+ certification, you will possess the key skills to troubleshoot, configure and manage these systems and keep your company productive. CyberProtex can help get you there! ​Network+ will be extremely helpful if you decide to pursue the Security+ certification, especially if you are lacking in the technical background. The Network+ certification is not required to sit for Security+ so this course can be taken without the exam voucher. We cover all the topics of the CompTIA (c) Network+ Certification. We provide you dynamic daily Live Lectures, give sample tests, share mnemonic devices to remember key facts, an official study guide, and provide anecdotes from real-world cyber security scenarios to help prepare students to take and pass the exam. The exam voucher is given during this course, but the student IS responsible for scheduling the exam by finding the most convenient test center closest to them. Network+ five-day bootcamp is available on demand for groups of 8 or more and is available to individuals on our regularly scheduled calendar. ​CompTIA Network+ meets the ISO 17024 standard and is approved by U.S. Department of Defense to fulfill Directive 8570.01-M requirements. It is compliant with government regulations under the Federal Information Security Management Act (FISMA). PLEASE NOTE: WE PROVIDE THE NETWORK+ CERTIFICATION EXAM VOUCHER FOR THIS COURSE, BUT THE EXAM WILL NEED TO BE SCHEDULED SEPARATELY.